David Villa fires it by Columbus defender Michael Parkhurst. USA Today Sports. New York City Football Club clinched second place in the Eastern Conference and a first-round bye in the playoffs with a 4-1 win over Columbus Crew SC on Sunday at Yankee Stadium. NYCFC finishes the regular season with a record of 15-9-10 with 54 points. They edged out Toronto FC by one point for second and finished three points behind the Red Bulls for the top spot in the East. This is the first time NYCFC has made the playoffs, in their second year in existence. This season is a 17-point improvement over last season. One of the biggest differences between year one and year two of NYCFC is that Patrick Vieira replaced Jason Kreis as Head Coach. Vieira said of leading NYCFC to the playoffs, "I don't want to talk about last year because I was not here. When I came over to this football club, I find people who were prepared to work together, players who wanted to do well, and of course, that made my job easy. We were working really hard in training, on the pitch, and that hard work make us qualify for the playoffs. Of course, when I came, from the first game in Chicago (a 4-3 NYCFC win on March 6th), the team improved and we have a clear philosophy of how we wanted to play the game. All the credit to the players and the staff because I think we worked really hard to be where we are today." The biggest change for NYCFC in this one against Columbus was that Eirik Johansen got the start in goal, his first in an MLS match this season, in place of Josh Saunders. Johansen was tested in the fourth minute when Hector Jimenez came in on a breakaway and he made a point-blank save. The game was scoreless until the 45th minute when David Villa came down the left side, and fired a cross into the box to Steven Mendoza, who buried it to make it 1-0 NYCFC just before the half. Columbus put pressure on at the start of the second half, as Tony Tchani got a strong shot on net in the 47th minute that was turned aside by Johnansen. In the 50th, Villa was looking for a goal of his own, and he fired it off the right crossbar, then the ball bounced along the goal line before careening off the right post and out. That kept it a 1-0 game. Columbus took advantage a short while later. In the 59th minute, Justin Meram set up Ola Kamara to tie the game at 1. It stayed tied for a while, and NYCFC was looking for a spark when they subbed in Frank Lampard (in his first action in a month) and Khiry Shelton. 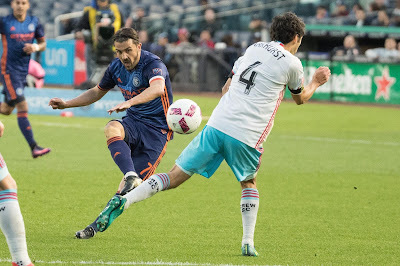 In the 75th minute, Shelton came down the right side, dropped it off to Villa at his left, who tapped it to Lampard, and he got it across the box to Jack Harrison coming down the center, and he buried it to make it 2-1 NYCFC and send Yankee Stadium into a frenzy. Just two minutes later, Harrison fed an outlet pass to Shelton, who came in on a breakaway and made it 3-1. NYCFC kept the pressure on, and Villa fired a strike from outside the box in the 93rd minute to make it 4-1. That wound up being the last play of the game. That was Villa's 23rd goal of the season, and he finished just one goal behind Bradley Wright-Phillips of the Red Bulls for the MLS Golden Boot award. NYCFC needed this win over Columbus to secure the second seed in the East, and it was the Captain, Villa, who delivered a passionate pre-game speech in the locker room. “I told the guys in the locker room before the game to remember the first day in Florida, with the runs in preseason and today play 90 minutes for the runs in Florida. The motivation today was easy and every player was amazing," said Villa. The biggest question to Vieira after the game was about whether Johansen will be his goalkeeper in the playoffs, and he said of his team as a whole, "I think not just about Eirik's performance, I think Khiry (Shelton) the way he came on, and Frank (Lampard) the way he came on, Jason (Hernandez) when he came on was also good. This team makes it very difficult for me to choose the starting 11, and that's what I want from them. My job is to try to pick up the players to win the game, and their job is to make it real difficult for me. It wasn't easy throughout the season, and we worry about the team from today and they make it very difficult for me."